Premillennialism teaches that there are Old Testament passages describing the Millennium, that it is not confined to the Book of Revelation. A holistic overview of both Old and New Testament passages about the Millennium shows that there will be those who resist the Messiah’s rule. Consider the following passages. Why should I ever be surprised at what turns up from the Lord? Here’s yet another reference to Hebrews 6; the one with the ‘Age to Come’ verses. AND it lines up with the current, albeit unplanned, focus upon training for ruling and reigning together with Jesus in The Millennium. In a profound encounter, the Spirit of God said, “It is time to go to the next new level!” I was instructed to prepare a remnant of Believers to position themselves to advance proceeding to the next new level, to possess the Land, and to possess and occupy! I said, “Lord, I don’t like the word remnant, it seems too selective.” He replied, “Don’t misunderstand; this invitation of advancement is open to all who will obey. Gender or age makes no difference, it is an issue of the heart.” All are called, but few will come! It is time for the Prophetic Seers to go into the Courts of Heaven, behind the veil acquiring the Divine plans and purposes of God. The Spirit of Truth stands ready to release the Divine strategies and blueprints of heaven. This is not a time to be vague and dim, but we must be bright and alert clear and committed to advance the King in His Kingdom. Divine Dissatisfaction Producing a Holy Hunger! The Spirit of God is fanning the flame of discontentment within the heart of many. We can’t remain satisfied and content with our lack of power and spiritual authority; a cry of desperation must burst forth. “Enough is enough!” Ask yourself this question: Am I willing to pay the price to seek the Lord for promotion? This will be a season of swift acceleration and advancement if we put God first. We are instructed to seek the Lord while He is near (see Isaiah 55:6). We are reminded that we only find the Lord when we search with all our heart (see Jeremiah 29:12-13). If we make seeking Him and His Kingdom our top priority, He will take care of everything else (see Matthew 6:33). There is a wonderful grace offered for us to advance in the times of adversity! The invitation is extended to all saints; however, by a lack of commitment, many will disqualify themselves. This is a time to be desperate for the revealed glory of God. One of the marks of these overcomers will be hunger and complete dissatisfaction with business as usual. This holy hunger will drive us to seek the Lord on a much more increased level. Jesus states, “Blessed are those who hunger and thirst for righteousness, for they shall be filled.” The Amplified Bible reveals, “those who hunger and thirst for righteousness (uprightness and right standing with God)…shall be completely satisfied!” (see Matthew 5:6). It’s time to remove all lids of limitations off and believe God for big things, assured that He is able to do much more than we could as or even think (see Ephesians 3:20-21). One way not to miss God’s new thing is don’t think it is already here. Yes, we are so thankful and grateful for all that God is doing, yet there is much more. The promise is that the whole earth shall be filled with the knowledge of God’s glory (see Numbers 14:21 and Habakkuk 2:14). The Spirit of God is stirring our souls and awakening our hearts to seek deeper depths and higher heights. This is the time for you to go all out for Christ and the Kingdom of God. Don’t hold back; surrender yourself entirely to the control and guidance of the Holy Spirit. The statement is so true: deep is calling to deep (see Psalm 42:7). This is a promise of transformational power being released, giving and unction to function. A roadway in the rugged wilderness and flowing refreshing rivers in the dry, barren desert. Nothing is too hard for our God (see Job 42:2 and Genesis 18:14)! You have heard [these things foretold], now you see this fulfillment. And will you not bear witness to it? I show you specified new things from this time forth, even hidden things [kept in reserve], which you have not known. We do not have time to delay, the Spirit of Truth is preparing a remnant to proceed to the next new level; we must advance and make progress(see Ephesians 5:14-15). In this next new level, we will begin to grasp a higher, clearer insight into the majesty of the Master. Prepare to behold the living Lord Jesus in a much clearer way. I pray that 2019 will be filled with the overflowing favor of God upon you and your loved ones. Embrace the promises of God’s new day. Expect to see God’s mighty power! Arising from references to The Divine Council and Millennium training in comments on a prophetic word on the UK Government, and how the Church can influence it by virtue of its Kingdom authority, a reader asked me about such training within churches. It’s an excellent question in view of the implications in that word, and in others brought by Bobby Conner, Neville Johnson, Lana Vawser and Veronika West to name a few, on bringing the Kingdom of Heaven to earth (eg, Lana on prayer lives being filled with holy fire). Bethel Church, Redding, CA & White Dove Ministries AL, in USA. ‘At an inter-stream conference in March 2011 in Winchester, King Alfred’s capital of Saxon England, the Lord drew my attention to the unwritten book hiding behind my Bible’s back cover! That is, beyond The Apocalypse, or Revelation given to Jesus Christ, for showing to and recording by His close disciple and apostle, John. About 10 years ago I was particularly blessed at a conference in Bath where Paul Keith was teaching. As a listed art-deco cinema, the sanctuary area of Bath City Church has cinema seats sloping down to a broad, deep level floor in front of a raised platform. I recall him teaching from that floor when he got a prophetic word for someone sitting in the rear of the auditorium. Suddenly, he strode up an aisle to deliver it closer to the person. However, whilst passing me in an aisle-seat on his left, he turned to look directly at me and told me: “Await His return!” – Wow, was I undone! So although Paul Keith was about to deliver a word he must have been diverted by the Holy Spirit to convey a brief command to me – one that must be mightily important for me to know and obey as an essential part of my destiny! So, I can but trust it’s true! Also, I’m not the only one having grounds for believing in the distinct possibility of Jesus Christ returning in their lifetime. A friend informed me he knows a lady in her 80’s who’s assured she will live to witness that event. And Nicholas, author of the previous post on moving into the Millennium is of a similar mind. Why the dates in this post’s header? 1989 is when I encountered Jesus. 2009 is when I began writing about End-times and biblical and contemporary prophecies. 6 Therefore, leaving the discussion of the elementary principles of Christ, let us go on to [a]perfection, not laying again the foundation of repentance from dead works and of faith toward God, 2 of the doctrine of baptisms, of laying on of hands, of resurrection of the dead, and of eternal judgment. 3 And this [b]we will do if God permits. 4 For it is impossible for those who were once enlightened, and have tasted the heavenly gift, and have become partakers of the Holy Spirit, 5 and have tasted the good word of God and the powers of the age to come, 6 [c]if they fall away, to renew them again to repentance, since they crucify again for themselves the Son of God, and put Him to an open shame. Many contributors and readers at AATW know that I believe the return of Christ is near. I will not state a year or make any of the specific predictions that date-setters do. I do not believe He will return in the next year; all I can say is that, in my spirit, I feel the coming and believe it will be within my lifetime. I have held this belief for some time. It is born from an intuition, deep within, and from reading Scripture. Jesus in His Olivet Discourse gave a sequence to help us understand when His return would be near: the Abomination of Desolation; the Great Tribulation; the darkening of the sky; the sign of the Son of Man and the return of Jesus on the clouds. ‘In the Beginning…’ not only means God and Jesus and Holy Spirit existed at the start of time but also implies they existed before the Beginning. That is, the Holy Trinity exists outside the creation of our known four dimensions of space-time. The Holy Bible is God’s revelation of His Story from the beginning to end of our created world, of specific historical actions and of events foretold but yet to take place. When Jesus unexpectedly burst – uninvited – into my life I realised that someone whom I’d thought of as only a historical personage, or supposed New Age Teacher, is still very much alive! His existence must, therefore, be outside our space-time continuum in a dimension beyond ours = heaven and eternity. That is, this invisible, immaterial book would continue Revelation’s closing prophecy of the physical manifestation of a new earth and new heaven with the City of God. It could mean eternity will be merging into time, heaven coming to earth at long last – the ‘Age to Come’. OR, maybe this is something the Lord will unravel and open for the ecclesia (Church) to learn about and understand? Stopped – on that unique day when the sun and moon stood still as Joshua fought the Amorites and their allies (Joshua 10:12-14). Went back – When king Hezekiah lay sick the Lord promised to lengthen his life by 15 years and gave as a sign the shadow of a sundial going backwards; or the sun’s rays were affected to bend the shadow (Isaiah 37:5-8). Split – according to the fulfilment of the ’70-weeks’ prophecy the Lord gave Daniel, of which 1+62 weeks (years) were to be continuous until the arrival of Jesus. The final 7 weeks would follow at an unspecified time in the future (Daniel 9:20-25). It is this ‘end-time’ of 7 years that’s awaited with great anticipation and expectation. Upon reading the full transcript of Malcolm Duncan’s message it resonated deeply within my spirit – as well as directly relating to personal experiences. Please bear with me as some of it necessitates reiteration. “…Denis shouted “And brother I came into the kingdom in 1947” and the minute he said it I thought, “I think God is saying something to me”. 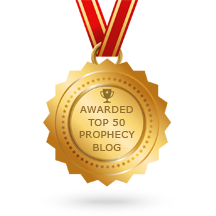 “I think Denis…he used you as a prophetic voice…So what came into my head was “the Smith Wigglesworth prophecy of 1947”. “I turned to Pauline and said, “Did Smith Wigglesworth prophesy his prophecy in 1947?”, and she said, “I don’t know but I was born in 1947”. Pauline’s reaction is mine too for I always recall that vision’s year is my birth year. Also, the timing of 50 years until my witnessing his prayer partner’s ecstatic joy at also seeing what will be happening across the British Isles is etched in my memory, as told in the previous post. “Is God saying something with these two things? The 50th year after Jean Darnall’s prophecy, a year of jubilee. The 70th year after Smith Wigglesworth prophecy, just like there were 70 years of captivity for Israel…I feel like Daniel must have felt like when he found Jeremiah’s promise after 70 years and said, after 70 years I am going to do something. On Good Friday 2015 Charles Shamp taught on the coming September’s fourth blood-moon as marking the beginning of the time of the Army of God. He believes it starts a two-year period that’s open for all believers, but especially for a glorious company praying things from the Age to Come. Thus, the two years until September 2017 will be an extra-special period, not judgmental and destructive. The details are recounted in A Scriptural context of…the Blood-Moon Tetrad; and under ‘2015 Feast of Tabernacles Blood-Moon’ header in its follow-up post I reported Charlie’s reasons. Those posts were written last September, but the first ones on that Passover-Easter conference appeared a year ago this month. Furthermore, I blogged about the personal significance of 40 and 55 year periods in ‘God-incidents’ Validate Cycles and Point to Near-Future. I didn’t, however, explain the personal relevance of 70 years to 23rd September 2017. My reaction was – “My 70th birthday’s the day before!”. So the 23rd September 2017 will start a new 70-year period for me. 70 is a biblically sacred number the two factors of which are perfect numbers, 7 and 10 representing perfection and completeness respectively. As such, it symbolizes perfect spiritual order carried out with all power, and can also represent a period of judgment (courtesy BibleStudy.org, which gives other examples to those Malcolm cites). Also, Jewish scholars teach that ‘The Torah has 70 Faces’, or levels of interpretation! ‘To succeed, the Partition Plan needed a two-thirds majority vote of the U.N. General Assembly. With just days to go before that historic vote on November 29, 1947, however, supporters of the plan were still three votes short. Some have suggested that President Truman personally called leaders of other nations to encourage them to support the American position. Others say he didn’t but that staff in his administration did; the record is not clear. Either way, most historians—including David McCullough, who won the Pulitzer Prize for his extraordinary biography Truman—acknowledge that Truman wanted the plan to pass and played a role behind the scenes. In the end, Truman got his way. The Partition Plan dramatically passed at the last moment, thirty-three to thirteen, with ten abstentions’.